Lava from the erupting Kilauea volcano on Hawaii's Big Island flowed towards a geothermal power plant on Monday as workers scrambled to shut it down to prevent the uncontrollable release of toxic gases. It was the latest danger from Mount Kilauea's eruption, which geologists says is among the worst events in a century from one of the world's most active volcanoes. Workers were now trying to shut down the plant's three wells, which at 6,000 feet to 8,000 feet (1,829-2,438 meters) underground tap into extremely hot water and steam used to run turbines and produce electricity. "We do want to shut down the wells so that we would eliminate the broader risk of uncontrolled release," of gases and steam from the plant, Hawaii Governor David Ige told reporters on Sunday. A berm was holding back lava flowing northwest towards the PGV plant and crews expected to cap two of its three wells, but were having difficulty with a third, the County of Hawaii said. "The flow is stalled about 250-300 yards (meters) from PGV," county spokeswoman Janet Snyder said in an email. "We are in the final stages of quenching two of the three PGV wells ... We have had difficulties quenching the third well." The state said last week it was pumping cold water into the wells and would cap them with iron plugs. Authorities are looking at alternative measures to kill the third well, Snyder added. About three miles (4.8 km) to the east of the plant on the coast, deadly clouds of acid and glass particles billowed into the sky as lava fell into the ocean from two flows blocking Highway 137, one of the main exit routes from the volcano area. 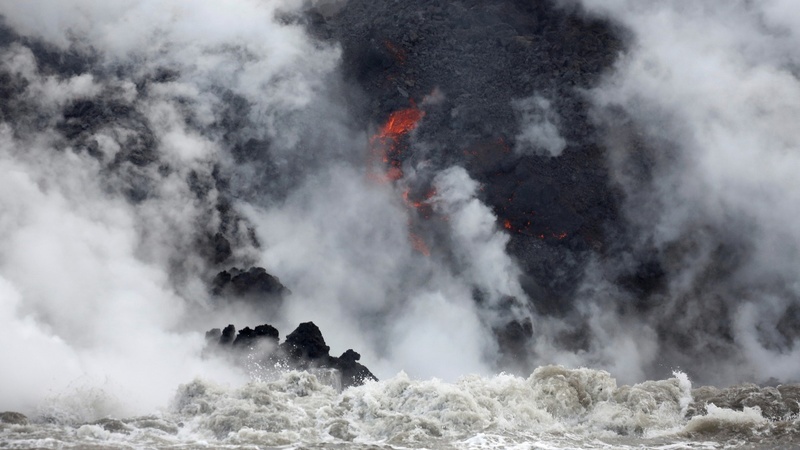 Laze -- a combination of "lava" and "haze" -- is a caustic a caustic mix of hydrochloric acid fumes, steam and fine volcanic glass specks created when erupting lava, which can reach 2,000 degrees Fahrenheit (1,093 degrees Celsius), reacts with sea water. "If one were to be near the laze, because of the various acids, it would be corrosive to the eyes, the nose and respiratory tract, and the skin," Dr Alvin Bronstein from the Hawaii State Department of Health told journalists on a conference call. Laze killed two people when a lava flow reached the coast in 2000 and authorities told residents to keep out of it, the U.S. Geological Survey (USGS) said on its website. Another hazard is methane explosions as lava comes close to pockets of decaying vegetation that created the flammable gas. "These are quite a big hazard in vegetative areas and the explosions can occur well away from the lava flow itself," USGS geologist Janet Babb said on the call. Geologists say Kilauea's eruption, which has already produced around two dozen lava-spewing cracks, has now entered a more violent phase, in which larger volumes of molten rock are streaming out of fissures and travelling further than previous flows. At least 44 homes and other structures have been destroyed in the Leilani Estates and Laipuna Gardens area of the Puna district, and a man was seriously injured on Saturday when a plate-sized chunk of rock shot out of a fissure. Two thousand people have been ordered from their homes due to lava flows and toxic sulfur dioxide gas, levels of which have tripled in the last two days, according to the County of Hawaii Civil Defense. Hawaii National Guard has warned of more mandatory evacuations if further highways are blocked.